– A prominent and often controversial theory is the theory of evolution as initially defined by Darwin. In basic terms it is the process of change where traits are different from generation to generation. Certain traits are more dominant than others; the same way in business where a business evolves over time. To stay in business certain traits need to change and others developed further. We are in the fifth megawave according to this cycle. It is strongly based on industrial and technological innovations and do not explain some of the social and human developmental cyclical changes. – Elliott Wave principle is used by technical analysts trying to understand financial markets. – Ichak Adizes from the Adizes Institute has developed the concept of corporate life cycles. 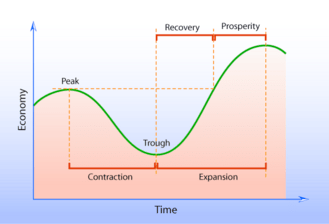 – Hype Cycles are used to indicate the adoption of various technologies over time. Technologies are mapped on a cycle that separates the hype from the realities of implementation. Theories that describe cycles, relate to the notion of time in a number of ways. We try to make sense of the unknown by predicting cycles of change (based a number of attributes) normally broken down into equal time buckets. The degree of change is another important dimension that can be used to understand changes systemically. Now think about the influence on company strategy; markets evolve, products and services (as offerings) evolve, people and social models change…to mention a few. In trying to make sense of future markets, cycle based theories are used to assist with high-level business planning.